One Environment. One Health. Sustainable Societies. Proposing the use of more sustainable chemicals. Many areas in the world are affected by pollution due to long-range transport of contaminants causing health hazards to local ecosystems, including indigenous human populations of the north. This underlines the fact that chemical pollution and its effects are indeed global, while new approaches for the management and counteractions have to be tailored for the specific environments in question. The backbone of this meeting is the recognition that environmental protection plays an important role in public health, and to contribute to our global goal of creating sustainable future societies. The scientific programme consists of 7 tracks for parallel sessions and 1 track for special sessions (invitation only). View the special sessions here. Regulatory programs seek to evaluate chemicals used by society to identify those that may pose high concern and potential risks to humans and the environment. For example, the Registration, Evaluation, Authorisation and Restriction of Chemicals (REACH) regulation aims to ensure that the risks from substances of very high concern are properly controlled, and to progressively replace these substances with more sustainable alternatives. In addition, there is a need to reduce animal (vertebrate) use and testing for chemical assessments. Early identification, management, and possible substitution of substances of concern is a key regulatory goal. In response to these needs, scientific methods and criteria to evaluate and identify chemicals of concern have largely evolved in the last ten years. For instance, there has been substantial progress in measuring and estimating biotransformation rates for organic chemicals, a key parameter that influences assessment of chemical bioaccumulation in fish and terrestrial organisms. Biokinetic processes play an important role in ecological and human health assessments by influencing a substance’s fate, exposure, bioaccumulation, and toxicity. Biotransformation and elimination rate (i.e. BiER) data can be utilized in diverse contexts for chemical assessments (screening, prioritization, substitution, risk assessment). There are numerous efforts to collect existing or generate new BiER data measured in vitro and in vivo in various species, as well development of computational (in silico) models. This session will highlight scientific developments in BiER-related science and demonstrate how these data streams can be used for different context-specific objectives, including evaluations to reduce and regulate the use of chemicals in the environment, such as PBT assessment and exposure and risk assessment. The session may include, but is not limited to: database development, testing programs, QSAR development, PBP(T)K model development, species extrapolation / sensitivity analysis, in vitro method development / application, in vitro-in vivo extrapolation, and regulatory applications (e.g., risk assessment, prioritization / screening, bioaccumulation assessment, etc.). We welcome presentations that describe ongoing or planned projects related to biotransformation and elimination rates in various species / taxa (plants, invertebrates, fish, rodents, birds, veterinary / agricultural species, humans, etc.) as well as applications(s) and data gaps identified for legacy contaminants, emerging contaminants and chemical mixtures. This session will provide a platform to highlight ongoing efforts and applications, with an effort towards facilitating communication and coordination amongst stakeholders. Traditionally, the assessment of chemical safety (human and environmental) has been based on batteries of in vivo studies using only a few species selected as representative of all taxonomic groups, boosted by some in silico and/or in vitro approaches and a knowledge of human/environmental exposure levels. Whilst this approach has been routinely used for new chemicals, it is not possible to generate complete toxicological profiles with traditional testing strategies for all existing chemicals. To address this problem, there is ever more the need to improve our ability to apply chemical read-across approaches and cross-species extrapolation to fill data-gaps. The use of safety information can vary across the complex landscape of applications, although generally, current approaches are usually based upon “worst-case scenarios” and aimed to be protective rather than realistic. Increased mechanistic understanding of toxicity has provided a broader awareness of toxicity pathways, similarities across species and has led to an increased uptake of Next Generation Risk Assessment (NGRA) approaches, simultaneously, increasing testing speed, decreasing costs and reducing regulatory drivers for in vivo testing. New approaches methodologies (NAMs) are greatly enhancing our abilities to improve decision-making both in human and environmental toxicology. Whilst recognising that the use of molecular-based/high content data and mechanistic approaches for assuring human/environmental safety is still in its infancy, there is a growing appreciation that such approaches have the potential to support and complement traditional (eco)toxicological approaches and catalyse the paradigm shift to proactive pathway-based cross-species data generation. However, although significant progress has been made, there are currently still relatively few examples that demonstrate the confidence to use AOPs/mechanism-based assumptions to realise cross-species (including human) extrapolation using molecular-based/high content data. We believe that there is value in reviewing existing examples across both human and environmental safety, with a potential for developing new tools and, where appropriate, embedding these into regulatory decision making. We are organizing this session to invite works focused on improving mechanistic understanding of toxicity for both human and environmental-relevant species using NAMs (including omics data) linked to adverse outcomes. These can include in silico, in vitro or in vivo non-vertebrate studies. Abstracts involving modelling (empirical, conceptual, and process-based), site-specific case studies, novel testing strategies for risk assessment, and issues in environmental management are also encouraged to apply. We intend to address the question: How can we maximise the synergies between NGRA data generated within Human Health and the environmental space to support safety decisions? Likewise, we encourage submission of work demonstrating where environmentally-relevant data can be used to aid human-related decisions. We welcome work discussing experimental as well as data-mining and modelling approaches. We will invite speakers from stakeholder groups including policy makers, governmental regulatory agencies, industry and academia to present on these challenges. Finally, we welcome discussions on how to improve the use of weight-of-evidence approaches, under current legislative packages. 1.05 - Can We Demystify Machine Learning for Environmental Chemistry and (Environmental) Toxicology? Can we accept machine learning applied to environmental toxicology and chemistry? To what extent is the introduction of ML approaches in environmental toxicology and chemistry feasible? What are the limitations and the benefits? How to demystify ML approaches in the field? How to improve the interpretability and acceptability of ML? What are the best procedures for ensuring acceptability, reliability and understandability of the chosen approaches? Does the performance outweighs the increased complexity of ML compared to classical modelling approaches? What are novel promising fields for the application of ML in environmental chemistry and toxicology? This session welcomes abstract submission of machine learning and AI applications to any environmental chemistry and toxicology question. Additionally, insights, reviews, discussions as well as negative/positive commentaries on the use of such tools are most welcome. The session aims to be open to both experts and non-expert modellers, aiming to initiate a discussion on how the scientific community can benefit from machine learning and what are the real limitations and possibilities. Abstracts will be evaluated for the quality of their content, as well as for their potential to advance the current understanding or applicability of machine learning techniques to the field of environmental chemistry and toxicology. Microplastics have long been recognized as environmental pollutants causing impacts to marine and terrestrial life. However, the importance of the smaller fractions, nanoplastics, has only been documented in recent times. Nanoplastics, like other nanomaterials, have unique properties due to their size, shape and their capacity to interact with other substances due to their large surface area. Nanoplastics can produce physical damage but they may also be transported across cell membranes and persist in the environment due to their relative inertness. In this regard, mechanistic approaches are needed in order to identify the cascade of signaling events, at different levels of biological organization, which induce a cellular, whole organism or ecological response to nanoplastic exposure. The chemical composition of plastics makes them a conveyor for non-polar anthropogenic pollutants supposing an additional risk factor for which very little is known. This session aims at: 1) Gathering the information required to evaluate the risk posed by nanoplastics to the environment and human health in real-world scenarios; 2) Identifying the components of Potential Outcome Pathways at different levels of biological organization from molecules and whole organisms to ecological responses; for this, special attention will be paid to the mechanisms of nanoplastic internalization and to their toxic action by using suitable biomarkers as indicators of cytotoxicity, cell viability, oxidative and genotoxic damages. The use of high-throughput techniques (RNA-Seq and proteomics) may allow the generation of biomarkers (genes and proteins) of global importance in the elucidation of the biological effects of micro and nanoplastics. At the higher levels of biological organization it is important to consider structural changes at the level of population and communities and 3) Discussing the role of nanoplastics as vectors for other pollutants. In 1998, at an international SETAC workshop on endocrine disruption (ED) in invertebrates, it was concluded that more research was urgently needed to better understand and predict potential hormone disruption in invertebrates. Over the past 20 years, however, ED in invertebrates has received far less attention than in vertebrates, which has resulted in few examples of ED and still poorly understood hormonal systems in most invertebrate taxa when compared with vertebrates. On the other hand, several invertebrate models have been or are being incorporated worldwide into regulatory screening and testing programs for ED. In addition, significant advancements in toxicogenomics provide new and powerful tools to study hormonal regulation and its potential disruption in invertebrates. Recent efforts have also focused on applying the Adverse Outcome Pathway framework to study endocrine disruption in invertebrates. The objective of this session is to provide an overview of past and current invertebrate ED research, regulations, and test development and aims to identify key research needs, new developments in mechanistic research, and key research needs. We specifically encourage talks that provide high-level summaries of past and ongoing research and identify key research needs for ecologically, economically, and/ or toxicologically important aquatic and terrestrial taxa (e.g., mollusks, crustaceans, etc.). Higher-level overviews of studies focused on (comparative) endocrinology and mode-of-action in the context of ED are equally encouraged. Finally, talks that provide an overview of current ED regulations and test standardization and identify data gaps in current regulatory test approaches are encouraged. Scientific evidence suggests that environmental stressors, including natural and man-made chemicals and changes in biotic and abiotic factors, may influence the regulation of gene transcription, disrupt epigenetic processes and/or affect genetic elements, conditioning the sustainability and evolutionary fate of populations. These effects may be mediated by a wide variety of processes including alterations in transcription factor dynamics, DNA methylation, histone modifications, small RNA regulation, as well as the frequency and type of DNA mutations, including point mutations and structural mutations (copy number variation, insertions and deletions). These molecular changes may result in long-term impacts on fitness, health and disease in living organisms at the time of the exposure or later in life and, in some cases, may affect future generations. These processes are of fundamental importance in mediating the adverse effects of environmental stressors on individuals and populations and need to be considered within environmental risk assessment and chemical regulation. Indeed, epigenetic and evolutionary effects present new challenges for risk assessment as their adverse outcomes may occur long after the actual exposure to the stressor occurs. These delayed effects can occur in future generations, either via direct exposure of the germline during development (inter-generational effects); or even those not exposed to the initiating stressor (transgenerational effects). In recent years reports of multigenerational and transgenerational effects of stressors have emerged across a diversity of taxa, but often the mechanistic basis of these observations is poorly described and in some cases surrounded by controversy. Importantly, little is known about the normal functioning and natural variation in epigenetic traits, especially for environmental species and whether or not changes in those traits are responsible for adverse outcomes. Further, research is needed to identify the most informative epigenetic endpoints for risk assessment in order to address of the following key questions: When can a chemical or a class of chemicals be classified as hazardous by causing significant epigenetic effects on humans and other organisms? How do we develop standard test guidelines for epigenetic or evolutionary effects? Can ecotoxicological model organisms be used to develop effective and cost-efficient screening methods for epigenetic or evolutionary effects of chemicals in higher organisms including humans? What evidence is required to determine whether multigenerational effects have occurred and to elucidate their mechanistic pathways? This session aims to promote sharing of the current knowledge and a critical discussion of the future avenues of research and knowledge gaps in the field. We invite contributions that address how environmental stressors cause effects on gene regulation via a wide range of mechanisms including changes in methylation, histone modification, and post-transcriptional regulation that may manifest immediately upon exposure, later in life and/or in subsequent generations. Contributions that consider a broad range of taxa, from humans to wildlife species, are encouraged, as well as contributions discussing the development of model systems and recent technological innovations that will facilitate progress in this field. Overall, during this session we will promote the sharing of findings and ideas and discussion of future directions that will facilitate the incorporation of the emerging findings in environmental epigenetics into chemical risk assessment and decision making in the future. This session is supported by the EVOGenerate Work Group and Omics Interest Group and open to all interested in epigenetic and evolutionary effects of environmental stressors on living organisms. All those interested in this topic, in addition to participating in the session, are also welcome to join open meetings of these two groups during the SETAC conference. Fish models are commonly used in human and ecotoxicological research to investigate the impact of chemicals on whole organisms. In fact, many important biological functions are conserved between fish species and humans. Fish have a wide application domain, spanning from basic developmental biology, neurobiology, endocrinology to immunology. The small size of some available fish species including the zebrafish (Danio rerio) or medaka (Oryzias latipes) and their robust nature makes them ideally suited for application in automated high throughput screening. Furthermore, fish early life stages offer all the key attributes of a complex in vivo system (e.g. including metabolism), as well as the advantages of the in vitro assays, as tests can be conducted in multiwell plate formats with small sample volumes and run in short periods of time. These characteristics make them well suited for toxicity testing of environmental samples and to detect unknown contaminants in effect directed analysis (EDA). Research on fish over the last decade has been greatly facilitated by the increasing number of sequenced genomes, which are available for more than twelve species with more pending. This, together with recent advances in genetic and epigenetic studies, including gene knockout and transgenesis technologies, greatly facilitates the understanding of the molecular mechanisms of toxicity, making fish ideally suited for defining adverse outcome pathways (AOPs). Due to the large similarity with other vertebrates, there is also a growing interest in the application of fish model species in human disease etiology and early development. Fish early life stages have recently been used in several cancer genetics studies and drug discovery tests. In ecotoxicology, fish are also studied outside of the laboratory in their native environment. Prominent models for native fish models are roach (Rutilus rutilus) and rainbow trout (Oncorhynchus mykiss). Studying fish in their natural habitat allows to investigate further than simple dose-effect assessments. Within this session, we intend to show recent developments in toxicological research using a variety of different fish model species, novel systems, endpoints, assays and testing strategies. We will focus on molecular approaches that could lead to new AOPs. Results of toxicity studies of single stressors as well as complex environmental samples are of interest. Molecular effects, multigenerational effects, and population level impacts will be considered. We especially welcome presentations highlighting new Omics approaches for metabolomics, transcriptomics, epigenomics, proteomics and lipidomics, ideally linking these to phenotype for use in AOPs. The session will be interdisciplinary and bring together researchers across a wide range of research areas with the view to enhance approaches for studying adverse effects in human and wildlife. This session aims to address new developments in the evaluation of endocrine disrupting properties of chemicals. Specifically, we would like to invite speakers to present new testing/ assessment methods and organisms, as well as approaches for addressing common and novel endocrine disrupting chemicals (EDCs) and their mixtures that might affect estrogen, androgen, thyroid, steroidogenesis, or other endocrine signaling pathways. These scientific aspects should be complemented by presentations from the EDC assessor’s perspective with regard to experiences with applying the new ECHA and EFSA guidance on EDC identification and potential needs for its further development. The public concern about the health implications of EDCs has led to the development of current test systems, which include in silico, in vitro, and in vivo techniques focused on detecting potential endocrine activity, and in vivo tests that collect apical data to detect possible adverse effects. However, there are still limitations in existing testing approaches and research is continuing to close those gaps and to improve testing strategies and assessment of endpoints. Pragmatic, science-based approaches for EDC hazard and risk characterization rely on an integrated analysis of existing information in a weight of evidence assessment, based on specific and effective test systems. We invite speakers to present their test approaches that address specific gaps in current risk assessment, such as e.g. the lack of thyroid-specific endpoints in most vertebrate tests. Generally, we hope to discuss the gaps regarding: 1) adequately sensitive species and life stages; 2) mechanistic endpoints that are diagnostic for endocrine pathways of concern; 3) the linkage between mechanistic responses and apical, adverse outcomes; 4) dealing with complex mixtures; 5) consideration of concepts of potency as used in pharmacology and toxicology; and 6) linking between endpoints of different biological organization levels up to and including the population level. Based on these gaps, we encourage speakers to incorporate the AOP (adverse outcome pathway) concept and the 3R principles for optimization of in vivo and in vitro test systems. Although multiple in vitro tests exist and are currently being developed, validated in vitro tests (e.g., for thyroid disruption) are not yet available. This is somewhat surprising, since in a number of countries animal testing is prohibited, for example for the safety assessment of cosmetic products, or not required for low tonnage industrial chemicals. These elements highlight the need to further develop screening and testing strategies for investigating ED properties, including in silico and in vitro methods that anchor chemicals acting through an endocrine mechanism to adverse apical responses. In this session we aim to recruit a diverse panel of speakers to address topics that contribute to filling the gaps outlined above. Wildlife, birds, mammals, reptiles and amphibians, are exposed to a range of contaminants and exposure routes and scenarios may differ. Generally, ambient exposure levels appear to be decreasing, although the number of chemicals that organisms are exposed to has increased. Hence, exposure may appear at relatively low levels but chronic over time and in an expanding cocktail. Nevertheless, at contaminated sites free ranging animals can still be exposed acutely via dietary, respiratory or dermal routes to relatively high levels of chemicals, e.g. purposely released in the environment, including plant protection products, insecticides or fungicides, or rodenticides. Effects to low level chronic exposure are generally non-lethal, and may affect a range of elusive endpoints like behaviour, immune competence or disrupt the endocrine system. However, assessment of such sometimes subtle effects can only be based on detailed insights in the modes of action at different levels of biological integration in well-designed studies taking relevant confounding factors into account. In contrast, acute toxicity may affect animals quite obviously, for example, mortality, but affected animals can be difficult to recover. Linking link molecular or ‘biomarker’ effects to individual health or even to impacts at the population level is challenging, although for both prospective as retrospective risk assessment concepts and approaches that can used to establish such links are essential. In this session we are soliciting presentations on effects at molecular and higher levels of organisation, and in particular studies that link between such levels in interaction with other environmental variables. Ecosystems are characterised by a high spatial and temporal variability and in recent years environmental risk assessment has begun to adopt strategies to address more and more this variability. At landscape scales, ecological as well as chemical processes may exhibit different dynamics as compared to standardized and one-dimensional test settings. Extrapolation of ecological effects of toxicants from such tests to other, more ecologically relevant spatiotemporal scales requires an additional effort. Therefore, the scientific and regulatory interpretation of such risk assessment in time and space becomes a complex exercise. Currently, at lower tiers, environmental risk assessment is a static approach based on worst-case assumptions for which results from standard toxicity tests are compared to the maximal expected exposure. However, exposure, effect manifestation, and recovery are dynamic processes which depend also on site-specific features. For the same reason, assessing the representativeness of specific experiments at the EU level is always a difficult task, even when more realistic approaches are adopted, like those used in higher tier studies (e.g., semi-field and field studies). In this perspective, modelling can play an important role in identifying the most influential drivers at each relevant scale, and therefore being used for predicting exposure and effects, but also as a tool to optimise experimental set-ups. In addition, current environmental risk assessment procedures, focussing on local scales, consider one stressor at a time. However, an increased consideration of the spatiotemporal scale may lead to take into account that populations and communities in the environment are subject to multiple diverse stressors. Presentations in this session may comprise, but do not have to be limited to, results about ecotoxicological effects and/or chemical exposure patterns obtained by the means of model simulations or measurements on mesocosms, field or monitoring campaigns. This session is inviting especially presentations of case studies which demonstrate how to link risk assessment output (lower or higher tiers, laboratory or field studies) to a realistic risk assessment taking into account the heterogeneity in time and/or space, e.g. how to construct risk maps to define vulnerability scenarios based on field studies or how to link exposure over time to effects on individual and population level in realistic landscapes. Also aspects of spatial ecology that influence ecotoxicological effects in the environment are highly welcomed so this session will boldly go where no man has gone before …Engage! Use of plant data in chemical risk assessments and associated tools (e.g. species sensitivity distributions). The use and development of TKTD, population, community and landscape-level models for plant risk assessment. Linking experimental design with model input parameters. Challenges relating to the measurement of reproductive parameters in plants and the use of these endpoints in effects models. Linking test design with predicted environmental exposure profiles in aquatic environments (e.g. pulsed dose studies for aquatic plants) and the role of modelling in predicting the effects of time-variable exposure. Experimental and modelling methods for evaluating the potential of plant populations to recover from adverse impacts. Understanding plant community composition and dynamics to inform protection goals, experimental methods and modelling approaches. Using plants in buffer zones to mitigate exposure of aquatic and terrestrial environments and the use of aquatic plants in artificial wetlands for phytoremediation and improvement of water quality. After the publication of EFSAs scientific opinion on pollinators and bees in 2013 the finalization of a new document on environmental risk assessment of plant protection products on beneficial arthropod testing is straight ahead. Major changes in these revised and proposed risk assessments are: i) their spatial scale which has been enlarged considerably from for instance field to landscape level and ii) the assessment of effects on biodiversity which is not explicitly addressed within the currently existing guidance documents. Therefore appropriate risk assessment methodologies and testing strategies needs to be developed. Also, surrogacy issues between test species in the lab or semi-field and wild species are a point of concern. Where for instance, bumble bees and solitary bees have become a focus of new regulatory research in Europe, in other parts of the world more attention is given to local species. Additionally, these risk assessments adopted a more mechanistic approach resulting in more sophisticated models which, in time, will feed into in risk assessment procedures. This session aims to provide a balanced overview of ongoing developments in pollinator and non-target arthropod risk assessment and consequently presentations in this session may comprise, but do not have to be limited to, finding adequate species to address new data requirements, results of first and higher tier effect studies, exposure assessments and modelling exercises. Aspects dealing with the spatial and temporal ecology of pollinators (including non-bees) and other non-target arthropods in various landscapes, ideas and opinions on the future changes of risk assessment, testing strategies (from lower TIER to semi-field and landscape level assessments) are highly welcomed. Global climate change is gradually but certainly being manifested by changes in the hydrology, the cryosphere, and the ecology of marine, freshwater and terrestrial environments. Most sensitive to such changes are the polar and alpine regions which show unprecedented warming twice the rate of the global average. Not only do these regions suffer at the same time from the persistent issue of long-range transport contamination, but there is also increasing evidence showing that climate variation is impacting spatiotemporal trends and biological effects, of persistent organic pollutants and mercury in wildlife. Primary and secondary contaminant sources are (re)emerging in the polar and alpine regions as a direct result of the impact of climate change on the abiotic environment, due to increased air and water temperatures, altered precipitation and air current patterns, and overall deteriorating ice conditions. These changes are also impacting biota via altered food web uptake and pathways and changes in migration patterns. However, there remain many challenges in understanding how climate change data and their variability can be best integrated with data on the levels and effects observed for different polar and alpine compartments, or optimally utilised to improve in silico exercises on the fate and transport. This session aims to provide a platform to promote scientific awareness of and facilitate discussion and dissemination of the latest research results on the effects of climate change on sources, pathways, and health impacts of legacy, emerging and yet-to-be-identified contaminants in polar and alpine regions. We especially welcome research elucidating relationships between spatial and temporal trends of contaminants and climate indicators, and how such research may interact with local or international chemical regulation, as well as how ongoing rapid environmental change in the polar and alpine regions resonates in emerging and altered primary and secondary contaminant sources. Aquatic and terrestrial ecosystems are intimately linked via reciprocal fluxes of energy, carbon, nutrients, and contaminants. These exchanges enable coupled ecosystems to subsidize each other inter alia, help characterise trophic connections, and are often critically important for the structure and functioning in the receiving habitat. For instance, the metabolism of small streams is often dominated by detrital inputs from riparian vegetation, whilst emergence of adult aquatic insects can be a major food source for terrestrial predators. However, these trophic connections can be affected – both in quantity as well as in quality – by anthropogenic stressors such as chemical pollutants. The role of terrestrial systems as a resource donor (i.e., land-to-water fluxes) is relatively well-studied, and toxicant effects on associated ecosystem processes has received considerable attention in the last two decades. Nonetheless, pollutant effects on these interactions are still not considered in regulatory frameworks. In contrast, water-to-land fluxes and the implications of pollutants in these have received much less attention, both from an ecological as well as from an ecotoxicological perspective. The integration of trophic ecology into studies of environmental toxicology and contamination is a promising new development. This allows researchers to better understand how chemical stressors may exert indirect effects mediated through the trophic interactions that link aquatic and terrestrial food webs. Contaminants can be used as biomarkers (i.e., tracers) of trophic relationships, thus helping to decipher the nebulous feeding linkages in real-world ecosystems that drive trophic cascades and more. However, this research area is in a nascent phase. Many challenges for both ecotoxicology and trophic ecology are still to be addressed, with new insights helping to understand fundamental as well as practical issues. In this session, we discuss research providing new conceptual and empirical insights addressing trophic ecotoxicology, ideally in the context of cross-ecosystem linkages and their assessment. Amphibian and reptile toxicity data have not been traditionally taken into account when assessing risks of man-made chemicals that are released to the environment. For plant protection products (PPP), concerns have been raised that the current risk assessment schemes may not sufficiently cover the risk for amphibians and reptiles exposed to intended uses of these substances. The European Food Safety Authority (EFSA) recently published a Scientific Opinion on the state of the science on pesticide risk assessment for amphibian and reptiles addressing these concerns. Several open issues were identified pointing to important knowledge gaps that need to be addressed in order to complete an efficient risk assessment scheme for these organisms. On the exposure assessment side, a lack in data about the size and location of ponds inhabited by amphibians or the temporal and spatial patterns of agricultural area uses. On the other side, crucial information is missing for the effect assessment, such as the size and impact of oral and dermal exposure routes, impact of chronic exposure and on the sensitivity of amphibians and reptiles compared with other non-target organisms due to lacking toxicity data and tests. There are many uncertainties in the assessment regarding the impact of PPP and other environmental pollutants on amphibians and reptiles. This session welcomes communication in both the exposure and effect characterization, at any level of biological organisation, i.e. from physiological responses to field studies, that contribute to fill knowledge gaps and reduce uncertainties relative to the assessment of risk of environmental pollution on amphibians and reptiles. Today, almost all organisms on Earth live in habitats modified by the actions of humans. Legislators and the media often focus on death or severe reproductive malfunctions. However, animals that fail to forage efficiently, avoid predators or attract mates will accrue zero fitness. Behaviour, therefore, provides a sensitive, non-lethal biomarker of responses to environmental change by integrating multiple levels of biological organization. Importantly, contaminant effects that occur at the molecular or physiological level can manifest at much higher levels of organization, such as behaviour, often times leading to population, community, or even ecosystem level effects. Understanding such adverse outcomes is further challenged as the chemical “universe” continues to change through time as older compounds are phased out and newer substances enter commerce. For example, pharmaceuticals, pesticides and endocrine disrupting chemicals in the environment can alter reproductive and foraging performance. To date, research in behavioural ecotoxicology has largely focused on direct effects of contaminants on individuals, but chemical contaminants can also affect animal behaviour indirectly. For instance, when contaminant-induced changes to animal behaviour in one organism or species have cascading effects on other organisms and species in the exposed system. While the importance of investigating both direct and indirect effects of contaminants is evident, this multi-directional approach has rarely been applied in ecotoxicology. The main objective of this session is to focus on studies conducted at environmentally relevant concentrations, and unravel behavioural end-points that are ecologically and evolutionarily relevant to the fitness of exposed animals. Specifically, we welcome research projects that have explored both direct and indirect effects of chemical contaminants on behaviour of wildlife, but also projects that have attempted the ‘lab to field’ approach to predict the ecosystem outcomes of the ecological effects of chemical contaminants. This session will provide a platform to experts from different disciplines and career stages who will provide insights into the behavioural responses of animals (both terrestrial and aquatic) representing multiple trophic levels among vertebrate and invertebrate species, to chemical contaminants. The ultimate objective of the session is to consolidate the current state of knowledge on behavioural effects of chemical contaminants and other stressors to effectively inform future environmental assessment management in natural systems. In response to environmental quality deterioration, policies, like the EU Water Framework Directive (WFD), have been adopted that aim at achieving a good chemical and ecological status of water bodies. According to the EU WFD, monitoring strategies should include the assessment of both ecosystem structure and functioning in the determination of the ecological status. However, in practice the monitoring of surface waters often only encompasses structural measurements related to physicochemical parameters or biological community composition. Although a proposal for an EU Soil Framework Directive was withdrawn in 2014, different regulations aim at preventing or reducing soil quality deterioration, by preventing damage to ecosystem structure and function with the final aim to protect ecosystem services. Yet also in the case of soil, such aims are mainly approached by assessing structural endpoints. These point-in-time measurements of structure are, however, no reliable indicator of impairments caused by contaminants. It has been argued that monitoring of ecosystems should also include measurements of functional parameters. Yet, in current monitoring strategies, ecosystem functioning, despite its relevance, is largely overlooked. Therefore, this session aims to explore the most recent findings regarding the incorporation of ecosystem functional parameters into environmental quality assessment strategies. This session welcomes contributions that investigate the relationship between multiple stressors, like contaminants and eutrophication, and ecosystem functioning. We aim for studies that link the performance of individual organisms under single and combined stressor exposure with ecological functions at higher levels (population, community, ecosystem, landscape). Studies that combine the use of bioanalytical tools and measurements of ecosystem functional parameters are also highly appreciated. Understudied aspects include linking single bioanalytical responses resulting from stressor exposure to ecological functions at higher levels, defining which functional parameters are best fit to assess and predict combined stressor effects, defining which environmental compartment jeopardizes ecosystem functioning most, the relationship between ecosystem structure and functioning, regulatory aspects of incorporating ecosystem functioning into quality assessments, the relationship between ecosystem processes, ecosystem functioning and ecosystem services and the development of integrated methodologies that better predict the combined effects of stressors on ecosystem functioning. Although variation in the sensitivity of species to toxicants is a fundamental point always emphasized in ecotoxicology, and although it is agreed that variability is the primary factor in natural selection, the within-species variation is little addressed component in toxicological studies. However, studies have increasingly shown that different populations of a species vary in their tolerance to contaminants, and that individual variation within a single population can be marked. Despite this, in ecotoxicological (and other) studies one is normally only interested in means, and usually only uses variability in testing, if values from different groups have similar variances, which allows parametric statistical testing to be done. However, exposure to toxicants can affect the within-population variability. This then affects the possibilities of the population to tolerate other stresses. This possibility is relevant for all species and all measured parameters. Thus, the purpose of this session is to discuss, what can cause changes in individual variability as a result of stressor exposure and hopefully convince the listeners that variability could be an important endpoint in ecotoxicological studies regardless of the type of organism studied and parameter measured. (In our own studies we have actually seen that an oil exposure affects variance without affecting mean: while this indicates that there is clearly an effect of contaminant, the mean-based evaluation would not pick it up). Aquatic ecosystems are complex and dynamic adaptive systems driven by multiple biotic and abiotic factors. These factors encompass an intricate range of biological interactions and environmental pressures, and they all influence one another. Under global changes the interaction between these factors may be disturbed and can impair the normal functioning of the aquatic ecosystem. A set of parameters and mechanisms may be affected with repercussions at several biological levels. Hence, it is of crucial importance to understand how abiotic and biotic factors interact with one another in a changing world and how species respond to this disruption, as well as the implications along the trophic web. Additionally, in order to stablish early warning indicators and implement prevention or even mitigation measures, it is of high importance to comprehend the action mechanisms and adequality quantify the impacts resulting from global changes. This session is open to all contributions (oral/poster) focused on the combined effects of biotic and abiotic factors in aquatic ecosystems facing global changes, as well as on integrative tools to analyze these impacts from molecular to high levels of biological organization. Studies focused on natural environment as well as on controlled experiments are welcome. The transport and fate of organic pollutants is driven by physicochemical and biological factors. However, our understanding of the pivotal role of each of them in controlling organic pollutants’ biogeochemistry in aquatic systems remains uncharacterized, especially for emerging pollutants. We envisage a session covering the biogeochemistry and fate of a wide range of organic pollutants – from legacy POPs to emerging contaminants such as perfluorinated compounds (PFASs), organophosphate esters (OPEs) etc. Some of the processes we aim to cover in the session include: atmospheric, riverine and oceanic transport, biological transformations, the biological pump and the multiple interactions between biota and organic pollutants. We encourage communications including new methodological approaches such as gene and molecular tools and new modelling strategies. This session aims to gather research from environmental chemistry and microbiology, ecotoxicology, modeling and science at the interface of these fields. 3.02 - Chemical Exposure via Plastics and Synthetic Rubbers: Quo Vadimus? Plastics and synthetic rubbers pervade in almost every single aspect of our life. They offer many benefits (e.g., low production costs, longer shelf-lives of many food items, light weight durable materials). However, the current linear make-use-dispose economic model and a lack of proper holistic management have resulted in serious environmental and societal issues (e.g., marine plastic pollution, unsustainable exploitation of natural resources). As of 2015, 8300 million tonnes (Mt) as of virgin plastics have been produced globally, of which 6300 Mt have become waste with only 9% recycled. Therefore, initiatives have been commenced to keep the benefits of plastics and synthetic rubbers while reducing and eliminating their undesired societal and environmental impacts, with a focus on improving collection and recycling. However, many challenges remain in the current system, preventing the successful transition to a circular economy. In particular, a large variety of problematic chemicals may present in current plastics and synthetic rubbers. Some of them may interact with the polymers and lead to technical difficulties in recycling of these materials. In addition, some others are hazardous, many of which may be persistent enough to contaminate recycled materials, causing continuous and possibly wider leakage into the environment and human exposure during their multiple lifecycles (e.g. brominated flame retardants in plastics, PAHs and heavy metals in synthetic rubbers). In addition, synthetic rubbers, particularly those used as car tires, may enter the environment during their use phase, emanating from car tire abrasion and road surface wear: for example, up to 500.000 tonnes of car tire debris are estimated to be emitted into nature yearly on a European scale alone, with soil and waterways being the major sinks. These micro-sized tire wear particles and associated chemicals additives may thus cause undesired environmental exposure and adverse effects in some cases. To date, there is no clear overview of problematic chemicals present in plastics and synthetic rubbers. Therefore, it is critical to identify and remove problematic chemicals from primary plastic and synthetic rubber products to create clean, circular material cycles. This session aims to provide a platform for international experts to update ongoing progresses in the understanding chemical exposure associated with primary and secondary plastics and synthetic rubbers, including the environmental presence and ecotoxicological implications of micro-sized tire wear particles. New developments in analytical techniques, physicochemical properties, hazardous properties (e.g. persistence, bioaccumulation potential, (eco)toxicity and long-range transport potential), occurrence and exposure routes, risk assessment and management options are focus of this session. Ultimately, it aims to highlight critical future research needs to enable recycling and reuse while minimizing/eliminating exposure to harmful chemicals threatening our health and the environment. There is increasing need to fingerprint, monitor and assess complex mixtures of chemicals in the environment including known and unknown anthropogenic and natural compounds, as well as their transformation products. Much progress has been made within the last years in the development of novel tools for unraveling, monitoring and assessment of such mixtures. This progress provides for a paradigm shift from individual compounds to chemical and toxicological fingerprints related to human activities and sources of pollution, which can then be related to adverse outcomes on organisms and ecosystems but also to mitigations measures. Important approaches to deal with complex environmental mixtures include multi- and non-target chemical screening, effect-directed analysis, in vitro and in vivo toxicological profiling, pattern analysis and multivariate statistical approaches to unravel and group chemical and toxicological signals and to find links between contaminant mixtures, as well as techniques to predict mixtures in the environment. This session will bring together analytical and computational studies and approaches dealing with complex mixtures on all kinds of matrices (air, water, sediments, soils, biota, passive samplers) from terrestrial, freshwater and marine systems. Examples and suggestions to improve and expand such approaches into solutions-oriented monitoring and assessment (according to WFD and other regulations) are very welcome. The use of oxidants or disinfectants in water treatment is practiced in a variety of different applications. These various applications include the chlorination of industrial waters to prevent biofouling, the disinfection of ballast waters to avoid the transportation of invasive species, the disinfection of drinking water and swimming pool water to eliminate infectious microorganisms, and the oxidative treatment of wastewater to eliminate micropollutants. Disinfectants/oxidants such as chlorine, chloramines, chlorine dioxide, and ozone are commonly used in water treatment. However, water treatment with disinfectants can form byproducts known as DBPs or oxidation byproducts (OBPs), many of which are considered toxic. Water treatment must be optimized to achieve the goals of the involved oxidative or disinfection processes while minimizing the formation of DBPs and/or OBPs. The formation of DBPs and OBPs and their release into the environment is an issue of concern because of the potential of these compounds to induce adverse health and environmental effects. This session will focus on the latest research findings about DBP and OBP analysis in drinking water, wastewater, swimming pool water, industrial water, and ballast water. The session will tackle recent advances in analytical chemistry particularly in the use of high-resolution mass spectrometry in targeted and non-targeted screening, which have significantly enhanced our ability to identify DBPs and OBPs. Moreover, the session intends to present new data about the fate of DBPs and OBPs once released in the environment as well as the latest findings regarding their toxicity and environmental risk assessment. In addition, the session will cover treatments that can be used to minimize or eliminate DBPs/OBPs. The anticipated audience of this session includes environmental chemists, toxicologists, engineers, as well as regulatory agencies. Discarded military material is present worldwide in seas and oceans. Apart of safety concerns, such items can be a source of pollution to marine environment, and affect benthic habitats. Dumped or unexploded ordnance contains a number of harmful substances – ranging from toxic elements, such as Arsenic, Mercury and Lead, via carcinogenic explosives up to actual Chemical Warfare Agents. Chemical munitions were produced in mass during first and second world wars. During second world war, they were never used in battle in the European theater, and in other areas of the world their use was very limited. This resulted in an excess amount of chemical munitions, which are very difficult and costly to destroy. In many cases, those munitions were dumped in sea, which created an environmental problem for future generations. In the case of Baltic Sea, the amount dumped is around 40 000 tons, with additional 200 000 tons dumped in Skagerrak Area. Globally, chemical munition dumpsites are located also in North Sea, Atlantic and Pacific Oceans, Adriatic and many other sites in various seas. Conventional munitions are also dumped in mass in many marine areas of the world, and degradation products of explosives are known toxicants. Since remediation of areas containing both conventional and chemical munitions is progressing very slowly, there is a need to consider their impact on environment and management options, in order to keep ecological situation under control. At the moment studies on discarded military material are scattered. The aim of this session is to bring together studies on new approaches in munition studies, which could effectively track the impact of dumped munitions on environment – including biota, sediments and water column. Presentations will focus on several areas: -Release and transformation of explosives, metals and warfare agents to benthic environment, – Modelling of release and transport of munition constituents – Impact on biota, including acute and chronic toxicity, biomarker effects, ecological impact based on community studies and models. Session will include also management approaches – remediation strategies, impact assessment and classification of threats. Concerns over the environmental impacts of UV filters have received considerable attention in recent years. Of particular concern has been the potential of certain UV filters to cause coral bleaching. These concerns have led to the introduction of state and county level legislation in Hawaii regarding the banning of certain UV-filters in sun protection products. While the use of UV filters as active in sun protection products is widely documented, the ability of these materials to filter UV radiation means these materials are also used in several non-OTC drug applications. These include uses in plastic and apparel, in which the photoprotective properties of UV filters protect against photodegradation of structural components and pigments. Multiple potential point and diffuse environmental sources of UV filters exist, such as bathers and swimmers, wastewater treatment plants and leaching from plastic debris and clothing fibers. Once UV filters enter the aquatic environment their fate depends upon a number of processes, such as degradation and partitioning into different environmental matrices (e.g. sedimentation). The presence of a particular UV filter in the environment also raises the possibility that it will exert ecotoxicological or physical effects on marine biota. The possibility of a UV filter bioaccumulating in aquatic organisms, or exerting effects on various biological functions (for example, endocrine-mediated impacts) also exists. However, the presence of a UV filter does not mean that it will be available for uptake into an organism or if it will negatively impact the organism. If effects are observed at environmentally relevant concentrations, then a UV filter may pose an unacceptable environmental risk, which then needs to be managed. The current session explores sources, occurrence and concentration in water, sediment and biota, fate and effects of UV filters in the aquatic environment (freshwater and marine). The aim of the session is to advance our knowledge of the risk that such materials may pose and start a scientifically grounded discussion on the implications of this. Hydrophobic contaminants are used in a broad range of applications from personal care products to heavy industry. Persistent hydrophobic contaminants are widely recognized for their potential to bioaccumulate and potentially affect ecosystems. Such pollutants do not only include legacy pollutants, such as PAHs, PCBs, Dioxins, and DDTs, but also emerging contaminants, such as organophosphate and organohalogen flame retardants, PFASs, chlorinated paraffins, and pharmaceuticals. Based on their physico-chemical properties they have low solubilities in water and air, and tend to sorb to soils, sediments, various fractions of biological media, and to mobile particles. This makes the investigation of (long-range) particle-facilitated contaminant transport important. There is particularly a knowledge gap on the mechanisms of the mass transfer between particulate bound and freely dissolved contaminants. The sorptive properties of these chemicals are also leading to conceptual, technical and analytical challenges in the laboratory, and standard tests and international guidelines are often not well suited for determining the physico-chemical properties, bioaccumulation factors and degradation kinetics for these chemicals. Furthermore, their hydrophobicity leads to high partitioning into biological membranes and potentially to toxic effects at very low aqueous concentrations. Beyond single substances, mixtures of hydrophobic organic chemicals include a wide range of petroleum products, essential oils, and isotopic mixtures of industrial chemicals. Experimental approaches are challenging as defined exposure concentrations accompanied by analytical conformation has to be provided. In particular, it remains very challenging to assess and test chemicals and mixtures that are (1) hydrophobic and volatile, (2) highly hydrophobic (Log Kow > 6) and (3) composed of hydrophobic and/or volatile chemicals. Detailed studies on the lab scale are not sufficient if the environmental fate and behavior should be described thoroughly. Consequently, this session also covers current developments and advances in measuring strategies with a particular focus on passive sampling approaches for all environmental compartments to determine the exposure to single substances and mixtures. Consequently, this session aims to explore adequate methods for a reliable assessment of fate and effects of highly hydrophobic chemicals and substances, which are additionally volatile or unstable. Furthermore, we aim to explore experimental techniques to study (de-)sorption kinetics, bioaccumulation potential, and environmental fate of hydrophobic contaminants and their mixtures in multi-phase settings. The data from such experiments can be applied to develop process-based models to understand the mass transfer processes, which drive the distribution of an extensive selection of contaminants. All these various approaches and steps are needed to compose adequate schemes to simulate, understand, and predict the fate and effects of hydrophobic contaminants and mixtures from the molecular to the global scale. Targeted contaminant monitoring methods provide exquisitely sensitive and quantitative tools for surveillance of well-known chemical hazards, but only a small percent of chemicals in commerce have ever been monitored by these highly specialized and resource intensive techniques. With growing interest in environmental causes of disease, and the need of chemical regulatory agencies to evaluate risks for thousands of old and new chemicals, nontarget and suspect-screening mass spectrometry approaches are now emerging for unbiased small-molecule monitoring of human and environmental samples. For this, the use of high resolution mass spectrometry (HRMS) is essential. New and unexpected emerging organic contaminants of concern (EOCs) are also now being discovered in environmental samples that have long eluded detection by target methods (including metabolites and/or their transformation products (TPs) of commonly monitored target compounds). Considering the high number of chemicals in use today, and the numerous transformation reactions possible for each, a vast number of compounds could end up in the environment. The goal is not to detect and identify everything, but by employing modern tools, suspect screening, non-target workflows, and chemoinformatics, many important EOCs may be discovered and prioritized for future monitoring. Similarly, new transformation products may be discovered in laboratory batch experiments which could also be prioritized for future target monitoring. However, many challenges remain for suspect and non-target workflows, including sample preparation steps, chromatographic and mass spectrometric techniques, quantification methods, and techniques for unknown feature identification. This session invites scientists interested in discovery and identification of novel substances or novel transformation products in human and environmental samples. Various strategies for study design and suspect and non-target method development are of interest, including technical advancements, new and improved library databases, software, and recent applications to environmental and human samples for better understanding of old, emerging and novel contaminant exposures and risks. Therefore, if your work is described by some of the following keywords, you are welcome to contribute to this session: environmental and human exposure, transformation products, metabolites, biomonitoring, LC and GC-HRMS, emerging contaminants, target-suspect-non-target screening, wastewater treatment plants, surface water, exposure biomarkers, by-products, biodegradation and/or photodegradation. Small plastic particles (SPP) are ubiquitous in the environment having been found in aquatic systems, soil and air. In the environment plastics may suffer multiple degradation processes and form increasingly smaller-sized particles, such as microplastics and nanoplastics. In addition, an increasing number of consumer products (e.g. food, drink, personal care products) have also been reported to contain these particles, increasing the probability of human exposure. Although a considerable amount of research is being performed to understand the risks associated with SPP exposure, the available studies with particles in the low micro and nanometer range are scarce, due to technical challenges (e.g. isolation, quantification and characterization). Considering that plastic particles are made of many different polymers, sizes, shapes, and chemical composition, all with different physico-chemical properties, an adequate characterization is essential for proper evaluation of sources, effects, mechanisms of action and long-term consequences. A decrease in particle size increases its bioavailability and potential threat to soil and aquatic organisms, but also presents challenges for their characterization. This session aims to bring together researchers of different backgrounds (e.g. toxicologists, analytical chemists) working on different matrices to review and discuss the current understanding of the risks posed by plastics, alone and combined with other environmental contaminants, to address new and improved methods for accurate sampling, detection, and characterization of SPP, to highlight key knowledge gaps and propose approaches to the problem of plastics in the environment. Overall, this session provides empirical data of SPP presence and distribution in environmental compartments; transport pathways and factors that affect their distributions; SPP interactions with environmental contaminants, methodologies for accurate sampling, detection and quantification; methodologies for evaluating its effects on aquatic and terrestrial ecosystems as well as on humans; and finally, highlight approaches to characterize and tackle the plastics problem. This session will provide an important and timely outlet for emerging research on SPP pollution and understanding the plastics challenge in general and fits well with the overall meeting theme of Environment, Health, and Sustainable Societies. Modelling and monitoring of fate and exposure of pesticides (incl. biocides) in the regulatory context is under continuous development in Europe as well as other regions of the world. Development of new models or the adjustment of existing models like changes in parameterization or scenarios are necessary due to new scientific knowledge and aim to a more reliable risk assessment for regulatory decision making regarding the protection of the environment whilst significant uncertainties remain. Monitoring campaigns of chemicals and metabolites are initiated to evaluate chemical status in different environmental compartments, whereas the questions on the regulatory context and implications of findings remain. The session will a) focus on the outcomes of recent developments on fate modelling under different regulations like new guidance documents, requirements and model developments. For example new guidance documents and scientific opinions on exposure assessment in soil, groundwater and surface water of pesticides have being developed by the European Food Safety Authority (EFSA). These shall be presented to and discussed by stakeholders from academia, regulatory authorities, industry and consultancy. For biocides, the European Chemicals Agency (ECHA) have the role of coordinating the European peer review process and have an increasingly important role in the associated development of risk assessments and emission scenarios documents in this area. New model or scenario developments shall be presented considering the spatial and temporal variability of the exposure and fate of pesticides in different environmental compartments. b) look at other regions of the world environmental risk assessment schemes, including modelling and their current developments and/or revisions (for pesticides e.g. in China, Latin America). A global exchange on exposure assessment principles (including modelling and scenario development) is warranted and it is the intention to bring together the latest developments in the regions of the world for different use classes of chemicals. c) provide a platform to discuss and exchange monitoring programs and results in the light of regulatory use. Modelling results shall be compared to monitoring data in order to allow an evaluation of their conceptual basis in relation to protection goals, which quite often may only be implicit in the underlying legislation. The regulatory use of fate models and scenarios for pesticides shall be discussed in the light of targeted experiments or representativeness analysis as well as survey monitoring results. The suitability of generic regulatory exposure scenarios and the development of tailor made scenarios shall be discussed alongside rules for their evaluation in a regulatory framework. As the scope of this session covers various chemical use classes, it is intended to focus the contributions in subsections, which are specific enough to attract the specialists but are linked and associated to foster the exchange between different scientific and regulatory communities. The assessment of the Persistence, Bioaccumulation and Toxicity (PBT) of the many thousands of chemicals in commerce is a global effort supported by the scientific and regulatory communities in the EU, Canada, US, Australia, Japan and many other countries. This assessment process is a cornerstone of the sustainable environmental stewardship of chemicals. REACH and the regulations on plant protection products (PPP), biocidal products (BPR) or (veterinary) medicinal products (VMP) aim to identify PBT and vPvB chemicals and to adopt effective regulatory measures. The need for a unified approach under different regulations for identifying and regulating PBT and vPvB chemicals has been recognized. In 2017, version 3.0 of the REACh guidance R.11 was published, in which several new aspects and new screening threshold criteria have been implemented. This session will discuss new and existing methods for the measurement and the assessment of the persistence (P) and bioaccumulation (B) of chemical substances. Emphasis is on methods that address current knowledge gaps and limitations and can enhance a weight of evidence approach to P and B assessment. Important issues for persistence are the evaluation of non-extractable residues (NER) (as either safe sink or potential hidden hazard), and how to assess the persistence of UVCB substances. Important issues for bioaccumulation are methods that improve bioaccumulation assessment including the use of in-vitro methods for biotransformation assessment, kinetic modelling and quantitative structure activity relationships. The aim of this session is to offer a platform for a balanced discussion with input from academia, regulators and stakeholders for presenting and discussing new scientific information and knowledge on the topic of PBT assessment, i.e. identifying of PBT/vPvB chemicals especially substances with long-range transport potential (LRTP) and long-term damage potential. This purpose of the session is to (i) inform the scientific community of the needs of the regulatory community on the topic of PBT assessment; (ii) inform the regulatory community of new scientific findings, methods and thinking; (iii) provide input and guidance for the development of a weight of evidence approach to PBT assessment and evaluation that has general application. The session will be subdivided into three topics, the status of the persistence and bioaccumulation assessment, the update on new insights regarding screening and simulations studies, and on new regulatory approaches. The session will not only address the status of the science but also encourage identification of further research needs from both a societal and regulatory perspective and how to translate relevant properties into effective, concern-based regulatory strategies. Current methods used to assess chemical exposures are insufficient to accurately establish the impacts of chemicals on human and ecosystem health. For example, exposure assessment often involves the use of averaged concentrations, assumes constant exposure of an organism and focuses on select geographical regions, individual chemicals and single environmental compartments. A combination of tools in environmental scientists’ toolbox can be used to address these limitations. This session will therefore include presentations on experimental and modelling approaches to better understand environmental exposures of humans and other organisms to chemicals over space and time, and the drivers of such exposures. We welcome submissions from the following areas: 1) Applications of novel approaches such as source apportionment, wireless sensor networks, drones and citizen science to generate and understand exposure data over multiple spatial and temporal scales, 2) Advancements in assessing exposures to multiple chemicals and from different land-use types, as well as the impact of an organism’s differing interactions with its environment, and 3) Quantification of chemical exposures at regional, continental and global geographical scales. This session aims at advancing efforts to combine models and measurement to better assess environmental distribution and exposure to chemical contaminants, reducing ubiquitous exposures and risks to public and environmental health. This session will focus on the inputs, the fate, the mass flows and the processes, controlling concentrations of organic micropollutants, such as pharmaceuticals, biocides, personal care products, flame retardants, and plasticizers in urban waters. In this context, urban waters include e.g., drinking water, wastewater, stormwater as well as urban surface and ground water. In these systems, a multitude of processes occur: on the one hand they occur in the engineered parts of the urban water systems while others occur in its natural parts. The engineered processes mainly cover biodegradation, chemical transformation (i.e. changes of bonds in molecules), as well as phase transfer (e.g. sorption to sludges, sewer sediments, activated carbon or biofiltermaterial) in e.g., sewer systems, wastewater treatment plants and stormwater treatment facilities. The removal by natural processes are of high relevance as they also can change the concentrations as well as the structures of the respective pollutants, in particular through transformation reactions (e.g., photodegradation and biodegradation), phase transition (sorption to sediments, soils, and man-made materials), and volatilization. In conclusion, emission scenarios from diverse sources, mechanisms and observations as well as innovative methods to describe processes in urban waters will be discussed during this session. Quantifying the exposure of trace organic contaminants is necessary for assessing their risks to non-target organisms. Several advancements in analytical chemistry techniques and bioanalytical methods have improved the understanding of the fate and transport of these substances in the environment. Not only that target compounds are quantified, their potential biological effects on non-target organisms can also be specified using bioanalytical techniques (e.g., bioassays). More recently, suspect and non-target screening methods using sophisticated analytical methods (e.g., high-resolution tandem mass spectrometry) further expanded the trace organic contaminant monitoring efforts to unidentified substances including transformation products. However, this progress is not matched by parallel time resolution and quantification in effect studies. Especially in vitro assays that are used for testing of water quality typically rely on nominal concentrations but do not account for variable chemical exposure. This will become important for quantitative in vitro to in vivo extrapolations (IVIVE) when in vitro assays are used to predict the risk for organisms. For whole organism bioassays, toxicokinetic or physiologically based pharmacokinetic models can additionally provide predictions that are helpful in establishing the linkages of exposure conditions to potential adverse effects in the wild. Hence, a combination of several techniques in exposure science is vital for monitoring trace organic contaminant dynamics in the aquatic environment and in organisms that were inadvertently exposed (e.g., fish, invertebrates). This session intends to attract interdisciplinary studies with a strong focus on the combination of advanced analytical methods with bioanalytical tools or modelling studies. The topics associated with this session include (but not limited to): field monitoring and modelling of trace organic contaminants and their mixture effects using bioanalytical tools to enhance risk assessment, scientific efforts to link chemical exposure to environmental effects, and the role of chemical, bioanalytical, and modelling approaches in advocating future hypothesis-based monitoring frameworks. To date, poly- and perfluoroalkyl substances (PFASs) have attracted increasing attention as emerging global contaminants of high concern due to their high persistence, potential adverse health impacts, and ubiquitous presence in the global environment, wildlife and humans. Numerous studies and control actions have been, and are being, made to understand and reduce the environmental and human exposure to many legacy PFASs, in particular certain long-chain perfluoroalkyl acids (PFAAs) and their precursors. This phase-out of long-chain PFAAs and their precursors was an important step toward solving the global environmental concerns related to this substance class, but further efforts are still needed, as elevated levels of many other emerging and novel PFASs have been detected in the environment, wildlife and humans. These emerging and novel PFASs include: [i] legacy PFASs other than long-chain perfluroalkyl carboxylic acids (PFCAs) and perfluoroalkane sulfonic acids (PFSAs) and their precursors, e.g. perfluoroalkane phosphonic and phosphinic acids (PFPAs and PFPiAs), perfluoroalkenes and their derivatives, side-chain fluorinated aromatics, and perfluoroalkylamines; and [ii] alternatives to long-chain PFCAs and PFSAs and their precursors that are still PFASs, e.g. shorter-chain PFASs and perfluoroether-based substances including perfluoroether carboxylic and sulfonic acids (PFECAs and PFESAs). Currently, some of these emerging and novel PFASs are increasingly being studied, revealing evidence of the potential of these substances for causing harm to the environment and humans. This session aims to provide a platform for international experts from academia, industry, governments and civil society to share recent and ongoing progress in the understanding of emerging and novel PFASs, regarding analytical techniques, physicochemical properties, hazardous properties (e.g. persistence, bioaccumulation potential, (eco)toxicity and long-range transport potential), occurrence and exposure routes, risk assessment and management options (including remediation technologies). Ultimately, it aims to identify and highlight future research needs and thus formulate a roadmap for prioritizing and accelerating future actions. Nanomaterials may enter the environment through a variety of processes, including, for instance, direct application or release, runoff from (agricultural) fields to aquatic systems, recreational activities, and via waste water treatment effluent and sludge. Nanomaterials undergo a range of chemical, physical and biologically-driven changes at all stages of their life cycle: from formulation into products, during the application of nano-enabled products, during use or as a result of aging, and following disposal or treatment in waste treatment plants, meaning that the nano-forms that are released at these stages differ from the pristine structure and composition. Further changes may occur once the nanomaterials reach the environment. As a consequence, the nanomaterials are likely to reach biological targets in complex and as-yet unpredictable forms. The different available forms will have different organismal uptake rates and the structure of nanomaterials may change further during biological processing following uptake (e.g. in the gut). It is crucial to understand the processes and transformations occurring throughout the life cycle of a nanomaterial in order to proceed with an accurate risk assessment and implementation of science-based regulation. Therefore, understanding to what extent the environment acts as a global reactor, with several small-scaled reactors at the individual compartment / organism level, is paramount. This will affect the environmental fate and speciation of nanomaterials and the complexity of the forms relevant for environmental hazard and risk assessment. This could mean dealing with multiple forms from one product, but where “reactor processes” transform numerous materials in similar ways or to similar exposure relevant environmental forms there may be potential for grouping (based on transformation chemistry). As our knowledge increases, development of functional assays designed to assess rates of transformation, and to determine the dominant transformation pathways, is enabling more robust testing of the compartment-relevant forms of nanomaterials. This session aims to cover studies that can provide a step forward towards addressing the data requests laid out in the new Annexes of REACH, specifically those on nanomaterials exposure characterization, looking at processes that induce changes in nanomaterials right from their release from products through their biological uptake and handling. The session seeks presentations looking at several potential “reactors” including waste water treatment plants, environmental compartments (air, soil, sediment, and water), abiotic and biotic key-actors, soil and aquatic organisms. Emphasis will be on chemical and biological processes that change nanomaterials and consequently affect their fate and environmental speciation (e.g. dissolution) as these will be crucial to obtain insight into exposure and toxicity to organisms. Understanding how the formation of a biomolecule corona changes the properties of nanomaterials and consequently the way they interact with organisms, and how the biomolecule composition of different environmental reactors drives the corona composition and effects is also to be explored. Toxicokinetic and toxicodynamic modelling will provide a crucial input on the role of biota as a bio-reactor that can also induce speciation changes or storage in an inert form. Studies linking aspects of nanomaterial exposure, time, uptake, internal processing and mechanistic effects will be especially welcomed, as well as those on approaches for assessing or predicting nanomaterial transformation under different conditions. Worldwide, people spend the clear majority of their time indoors where they come in close contact with a wide variety of chemicals that are part of building materials and products used in everyday life such as personal care products. Various types of Chemicals of Emerging Concern (CECs) like dirt and water repellents, flame retardants and plasticizers can be emitted from construction materials, electronic equipment, carpets, textiles, flooring and furniture through evaporation or abrasion, e.g. small particles breaking off from foam, textile fibers, etc. The complexity of the indoor environment is determined by the numerous sources of substances, where some of the substances are used in multiple applications and with different functions. From a human perspective, inevitably, exposure to chemicals in the indoor environment occurs, through inhalation of air, dermal uptake and ingestion of house dust and through hand-to-surface-to-mouth contact. The latter especially for young children that have frequent hand-mouth contact. Variability in human habits and practices is also a key determinant in exposures. There is a requirement to develop and test methods for quantifying exposures to humans in indoor environments as well as the potential for adverse effects that may result from these exposures. This session addresses the identification, analysis and quantification of chemicals present in the indoor environment, including analytical chemistry as well as process- and effect-based tools. Topics include quantitative target analysis of known compounds and qualitative suspect / non-target screening using high resolution mass spectrometry as well as the application of effect-based tools for toxicity characterization and Effect-Directed Analysis for identification of CECs. In addition, this session addresses human exposure modeling (processes) to simulate the fate of chemicals in indoor environments and intake rates and internal human exposures. Models are required to integrate the measured monitoring data (air, dust, surface concentrations) with biomonitoring data (blood, urine) and to address data gaps, i.e., predict exposures in the absence of measured data, for human health assessment. Models need to be tested (evaluated) to foster confidence in their application in regulatory programs. Research studies that combine measurements and modelling are most welcome. Research along the freshwater/marine water continuum to better understand natural processes, their vulnerability to climate change, and biogeochemical cycles of contaminants and nutrients, especially under extreme hydrological events. The occurrence, fate and behaviour of legacy, classical and emerging contaminants. Experts in environmental and analytical chemistry are invited to discuss the analytical strategies that allow to push down the limits of detection of their methods in seawater, marine sediments and biota. The ecotoxicological and/or -omics effects of contaminants under fluctuating exposure conditions and in realistic settings, as well as the ecotoxicological and ecological consequences of physical modifications of morphological RSS features and associated habitats. The potential for (emerging) contaminants to bioaccumulate and biomagnify along with the role of bioaccumulation as an indicator for the Marine Strategy Framework Directive. Soil, a precious and finite resource, which provides a habitat to flora and fauna, as well as the fertile basis for food security, is under increasing anthropogenic pressure. In recognition of the effects of stressors on soil, the United Nations Environment Assembly adopted a resolution calling for using science to address soil pollution within the environmental, food security and agriculture, development and health agendas; including by setting norms and standards, and by strengthening and promoting research and development (UNEA 3 resolution 6, 2017). To this end, we need to constantly assess whether current ecotoxicity and risk assessment regimes offer sufficient protection of soil organisms for them to deliver crucial ecosystem services, helping to maintain the soil’s structural and functional aspects. However, soil contamination by chemical (e.g., plant protection products, metals, etc.) and non-chemical stressors, are disruptive to these processes. At present, weight-of-evidence approaches such as the soil quality TRIAD, combining chemical ecotoxicological and ecological tools are widely accepted for the assessment of contaminated sites. However, it is not clear yet how far the existing ecotoxicological tools and bioindicators extend to the adequate evaluation of impacts on soil processes, including population and ecosystem effects. As a result, there is a need to evaluate whether current tools are adequate to capture the intended metrics (e.g., population or community level, species diversity); to address how soil properties influence bioavailability and toxicity; to allow the integration of semi-field and field studies into risk assessment; and to reflect ultimate protection goals. Within the scope of the European Plant Protection Regulation, EFSA has now published an opinion paper on the state of the science aiming at improving the prospective of risk assessment of in-soil organisms, paving the way to a revision of the current European guidance associated with authorization and handling of PPP. We also need to assess if there are any new developments in ecotoxicity testing and risk assessment, which will enhance our understanding of threats to soils to legacy, but also new stressors of concern (e.g., microplastics, effects of climate change). We would like to showcase new developments within soil ecotoxicology; advancements in our understanding of exposure (bioavailability) in risk characterization; relevant measures of biodiversity (long-term impacts vs community recovery); and examine the drivers of ecosystem services relevant to soil protection. This session will aim to review the evolving field of soil ecotoxicology and broaden the view to approaches at all scales of terrestrial ecosystems risk assessments. Bayesian network (BN) models are being increasing used in applied research fields such as conservation biology, fisheries biology, ecological status assessment and natural resource management, and have become popular tools in European research projects. The development of user-friendly BN software programs has made this methodology more easily accessible. BN models are typically used to predict the probability of specific outcomes under different scenarios, and therefore have a great potential for supporting environmental risk assessment. BN methodology is still not commonly used in ecotoxicology, but recent past presentations at SETAC have witnessed a high level of interest in the use of BNs also within this field. In response to this interest, a dedicated session on Bayesian networks for environmental risk assessment is proposed to encourage productive discussions about opportunities, challenges, best practices and innovations. 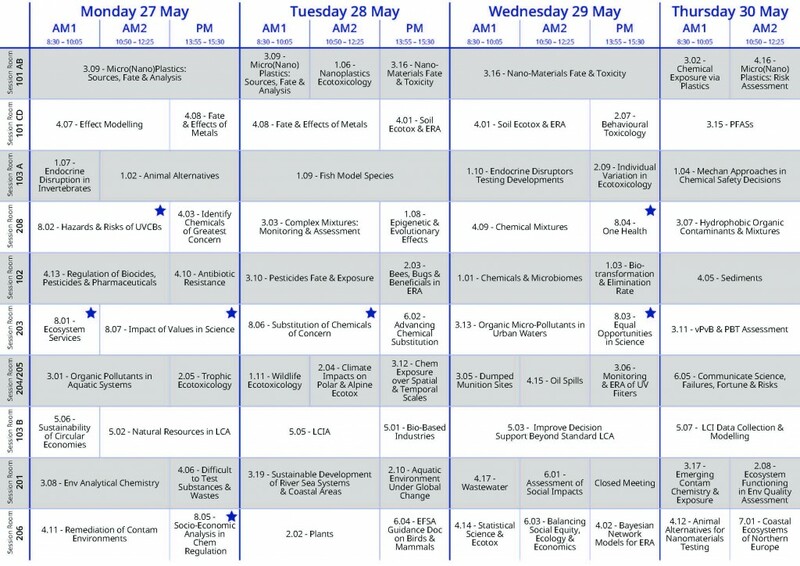 Relevant topics include, but are not limited to: prognostic vs. diagnostic use; combining different types of data and information; use of expert judgement and participatory modelling; handling of uncertainty and natural variability; multiple stressors and their interactions; prediction under scenarios of climate change; quantification of adverse outcome pathways; uncertainty and sensitivity analysis; evaluation of model performance. We welcome case studies from all fields of environmental research, and encourage participation from scientists across different career stages and experience levels. Presenters should emphasize the relevance of their Bayesian network modelling for ecotoxicology and ecological risk assessment. Over the past six decades, there has been recognition and concern for those chemicals with the greatest potential for widespread environmental impacts by virtue of their toxicity, persistence in the environment, ability to biomagnify up food chains, and to be transported around the globe. International agreements have sought to identify and control these highly hazardous chemicals. For example, the U.S.-Canadian Great Lakes Water Quality Agreement of 1978 sought the virtual elimination of persistent toxic substances. The Stockholm Convention on Persistent Organic Pollutants (2001) seeks to protect human health and the environment from chemicals that remain intact in the environment for long periods (persistent), become widely distributed geographically (long range transport), accumulate in the fatty tissue of humans and wildlife (bioaccumulative), and have harmful impacts on human health or on the environment (toxic). In Europe, the REACH regulations (2006) on chemical management seek the substitution of persistent, bioaccumulative and toxic (PBT) substances and very persistent-very bioaccumulative (vPvB) substances where suitable technically and economically viable alternatives are available. However, there is limited measured eco/toxicological and environmental fate information available which may be used to characterize most chemicals in commerce and a heavy reliance on quantitative structure property/activity relationships (QSP/ARs) to predict chemical fate and transport, bioaccumulation and ecotoxicity. There have been criticisms that hazardous chemicals are being detected in the environment as new emerging contaminants and that adequate mechanisms do not exist to properly characterize chemicals before they are widely used in commerce often because of data limitations. Equally, there are criticisms of false positives due to limitations of assessment criteria which results in overly precautious characterization or restriction. Consequently, in recent years questions have been asked about the ability and appropriateness of assessment criteria to identify and prioritize chemicals of concern. There is also a global discussion started as to whether highly hazardous chemicals can be safely used at all in commerce in ways that avoid environmental impacts. The present session is intended as a reflection on progress in the field since SETAC Pellston Workshops on related topics in 1998 and 2008. We therefore invite speakers working on new approach methodologies (NAM) or novel screening criteria that might be used for the identification and prioritization of chemicals of the highest ecological concern. The session would particularly benefit from risk-based approaches to prioritization, that is, those that include considerations of use pattern, use volume and potential exposure to the subject chemical. Additionally, we invite speakers investigating methods for characterizing the uncertainty in chemical prioritization approaches or criteria as a means to understand the impact of false positive and false negative outcomes while aiming for balanced accuracy. 4.04 - Can Regulatory Risk Assessment Protect Wildlife? Currently, pesticide risk assessment procedures in the EU consider individual birds and mammals in reproductive life stages as protective/indicative of the potential risk to all terrestrial vertebrates. At the same time, the intention is to preserve all types of vertebrate wildlife in agricultural lands. However, recent evidence indicates declines in, for example, many farmland birds. Hence, methodologies to assess potential risks to terrestrial vertebrates other than birds & mammals and during other life stages than reproductive adults are in development or under discussion (e.g. for young in the nest, for reptiles, for amphibians in terrestrial phases, and for bats or birds on migration). To develop and execute these methodologies, additional data are necessary. ‘New’ field methodologies to gather data for wildlife ERA, as well as reports of relevant data and proposals for wildlife ERA can be topics to be presented in the session. Aquatic ecosystems contain billions of tons of contaminated sediments, making sediments the largest chemical repositories on earth. With improved surface water quality, sediments now act as potential sources of toxicants, threatening aquatic ecosystem health. Consequently, sediment is the most relevant environmental compartment to link ecotoxicological effects to compounds. Nevertheless, contaminated sediments remain largely overlooked and understudied relative to assessments of water quality. The EU Water Framework Directive (WFD) mentions water on 373 occasions, but mentions sediment only seven times, and the directive does not require the member states to monitor sediment quality. Evidently, investigations into the effects of sediment contamination lag behind research on the water column and this represents a significant scientific and regulatory challenge. The need and possibilities for innovative research that can result in significant scientific progress in the field of sediment toxicology are numerous. Therefore, this session welcomes contributions on sediment contamination and sediment quality assessment, from a chemical, ecotoxicological and ecological point of view, particularly those that integrate these aspects. Understudied aspects of sediment toxicology are highly appreciated, including but not limited to: a.o. in situ exposure; effect-based quality assessment; ecosystem functioning; the role of bioturbation activity in mobilization of sediment-associated contaminants; the potential application of rooting macrophytes in sediment quality assessment; chemical analysis of suspected targets; advances in passive sampling to assess bioavailability of sediment-associated contaminants; the link between passive sampling and bioaccumulation; innovative sediment toxicity testing methods, including passive dosing techniques, choice of model organisms and test sediment and key sediment parameters to report; contaminated sediment regulation and management. There are often difficult to test substances or mixtures that pose inherent challenges caused by their physico-chemical properties. Multi-constituent substances such as essential oils, data poor metals or different waste materials can be considered among these. The lack of generally agreed approaches forces industry and regulators to use and assess tests following differing protocols and principles, as well as using data from the public literature. Environmental data requirements and guidance used under the different regulations do not always adequately allow for the specificities of these substances and mixtures. This leaves regulators and risk assessors without the necessary tools to assess and regulate these substances and wastes in a consistently robust manner. In the case of wastes, both waste owners and regulators are unsure on how to evaluate the ecotoxicity. From a theoretical point of view, it is difficult to evaluate such complex mixtures according to the CLP approach as often the detailed composition and potential the interactions between the various components is unknown. Moreover, ecotoxicological concentration limits or ecotoxicity values are not available for all waste components. From a scientific point-of-view, ecotoxicological tests are the most suitable approach, but the regulations, testing strategies and interpretive tools are not yet fixed. These issues inevitably lead to poor consistency amongst assessments, regulations and regulated substances and wastes. This session aims to give regulators an opportunity to present their needs in terms of data quality and highlight the key areas for improvement and to present their interpretation of the existing regulations regarding the HP14 criterion. For industry, including waste producers, and researchers, the session aims to discuss new methodologies to improve the quality of assessments and to overcome certain methodological or interpretational issues. The session will cover case studies and experiences when assessing the toxicity of difficult substances, wastes and mixtures. Regulatory risk assessment for chemicals depends on information about expected exposure levels in the environment and relevant effect thresholds. While exposure levels in regulatory risk assessment are often predicted by using modelling approaches, this does not yet apply for the derivation of effect thresholds. Despite effect modelling approaches have been developed and applied in the last years to increase our mechanistic understanding of ecotoxicological effects, effect models and predictions of effect thresholds are rarely used in regulatory effect assessment. Possible reasons in addition to the implicit inertness of regulatory systems include missing modelling standards, fragmentary model documentation, too few convincing examples, and open questions around the reliability of predictions. The use of effect modelling results in risk could overcome some of the limitations of experiment-based effect assessment in ecological risk assessment, namely the restrictions of experiments in time and space, the practical limitation of experiments to a few exposure or environmental scenarios or the limitation of risk assessment to some few standard test species. In addition, broad regulatory frameworks such as REACh have a high demand for standard toxicity data, but at the same time they promote the use of non-animal methods to create this information, to reduce testing on vertebrate animals, hence computational methods are much needed to fill data gaps. The number of effect modelling studies in the context of prospective terrestrial or aquatic environmental risk assessment for non-target organisms is increasing, and standards for design, documentation and testing have improved considerably in the last years. Nevertheless, more applications of ecological models, including TK-TD models for lethal and sublethal effects, population modelling studies and landscape scale models are urgently required for the development of a common understanding of the reliability of such model predictions and of quality criteria for their use in regulatory risk assessment. Equally, examples of predictions of toxicity across substances by e.g. quantitative structure-activity relationships (QSARs) or chemical grouping and read-across approaches are required in combination with assessments of their reliability to further develop them as a potent tool under e.g. the REACh regulation. In this session, we invite studies to present state-of-art in effect predictions and their application under different regulatory frameworks. Effect modelling enhancing the mechanistic understanding of ecotoxicological effects at different levels of biological organisation and allowing the derivation of regulatory acceptable effect thresholds for untested combinations of species and chemicals are welcome, as well as examples investigating applications and reliability of QSAR and related predictions. Regulations in Europe (e.g., REACH, CLP and WFD) have been the impetus driving the last 15 years of research examining the hazards and risks of metals in the environment. This has resulted in the development of new approaches to reduce the uncertainty associated with estimates of metal fate and toxicity in soils, sediments and aquatic environments. Examples include bio-availability models, fate models, evidence on extrapolating laboratory data to field conditions, etc. The application of these advances in science and modeling of metals in aquatic and terrestrial environments can contribute to pollution prevention, appropriate regulations, relevant environmental quality targets, and achievable risk management decisions. The focus of research on metals has expanded to include assessment of mixture toxicity, prediction of toxicity in tropical environments, and bioaccessibility in humans. Additionally, tools have been developed to implement advanced scientific principles into routine risk assessment and management processes. For example, guidance for implementing advanced risk assessment approaches for metals in water has been developed which will allow for more environmentally realistic compliance checking under the EU Water Framework Directive. This session will review, through case studies, the significant advances in the science related to metals and related regulatory initiatives and how scientific developments can contribute to more realism, and less uncertainty, in regulatory assessments of metals. While approaches for the assessment, management and mitigation of the impacts of local pollution from singular events and point sources are largely agreed upon and widely applied on a routine basis, the assessment of diffuse complex pollution scenarios is still a major challenge for science, environmental policy and chemical management. Meeting this challenge is critical for achieving the aim of a non-toxic environment, as outlined in the 7th European Environmental Action Plan. It will require to move away from a narrow focus on individual pollutants, coarse acute individual or population level end points, the exclusive consideration of single emission sources and exposure routes towards a broader, more holistic approach. Standard instruments for chemical risk assessment and management, such as Environmental Quality Standards (EQS), Predicted No Effect Concentrations (PNECs) and even Acceptable / Tolerable Daily Intakes (ADI / TDI) need to be modernized and embedded into mixture-aware regulatory frameworks. Also, the current strategy for priority setting is too often focused on identifying individual priority pollutants. There is therefore an urgent need to identify “archetypal” mixtures that result from common emission scenarios, in order to develop more realistic priorities for chemical management. The session aims to provide an overview and critical reflection of the current debate, to identify gaps and bottlenecks. On the one hand, the session aims to present and analyze the specific situations in the different regulatory arenas (e.g. REACH, the Biocide and Pesticide Regulations or the Water Framework Directive), using conceptual analyses or evaluations of specific case studies. On the other hand, cross-cutting, conceptual analyses are also highly welcome, especially if they link between human and environmentally oriented assessments. We invite presentations that analyze the issue from the perspective of all the different stakeholders (academia, industry, regulators, NGOs). The session has be successfully run at previous SETAC meetings, always attracting a sizable crowd, indicating that the topic is of particular relevance for the SETAC community – which is hardly surprising, given the fact that even preliminary monitoring data over and over confirm that organisms are typically exposed to a complex mixture of various toxicants from various sources. The development of antibiotics for control of infectious disease is acknowledged as one of the greatest public health accomplishments of the 20th century. Likewise, the inability to treat infections as a result of the emergence and growth of antibiotic resistance is recognized as a top public health threat today. The United Nations Environment Program identified the environmental dimension of antibiotic resistance as one of its top six emerging issues of environmental concern with global implications in its Frontiers 2017 report. International attention to the threat of antibiotic resistant bacteria (ARBs) has led to an expanding scope of surveillance beyond the clinical setting into a variety of environmental media. In addition, analytical techniques have improved greatly to permit the detection of antibiotic resistant genes (ARGs) in those same environmental samples. This session explores approaches to understand the occurrence and fate of antibiotics, ARBs and ARGs in the natural environment and subsequent risks to human health. The session will include presentations on: measurement and monitoring approaches for understanding sources and drivers of AMR determinants in environmental media; environmental fate and transport of AMR determinants; approaches to understand risks of selection of resistance by chemical contaminants; and methods to assess the implications of the presence of AMR determinants in the environment on human health outcomes. The use of green technologies such as bioremediation and phytoremediation for removing from soil and water ecosystems organic and inorganic pollutants, emerging contaminants (e.g. pharmaceuticals, microplastics) and chemical mixtures can be an effective, cost-competitive and environmentally friendly alternative to the thermal and physico-chemical technologies more traditionally used. This session will deal with this topic from different point of views. Examples of applications both at lab and field scale will be displayed. Moreover, the effectiveness of different treatments (e.g. compost, biochar, humic products, use of bio-surfactants, microbial fuel cells, etc.) in biostimulating contaminant degradation and the selection of bacterial strains from environment for bioaugmentation purposes will be illustrated and discussed. Particular attention will be also focused on the analysis of properties, quality and biological activity of humic preparations used for the sorption of pollutants and increasing fertility in agrocenoses, restoring the soil ecological functions in disturbed areas. The topical issues (e.g. reference sample) and modern achievements in bio-diagnostics of the activity of humic products of various geneses (coal, peat, sapropel, lignocellulose, etc. ), including their compositions with the microbial preparation, biochar, nanoparticles, etc. will be discussed. The bioavailability of potentially hazardous organic contaminants (persistent organic pollutants or POPs, pesticides, biocides, pharmaceuticals, etc.) in soil and sediment is an important issue to be investigated for understanding and improving the bioremediation strategies. Therefore, contributions on bioavailability-oriented biological treatment of soils, sediments or waters are also welcome. Finally, the potential combination of bioremediation strategies (e.g. phytoremediation) with providing valuable sources of renewable biomass, in line with the sustainability criteria of the Renewable Energy Directive (RED) will be discussed. For example, the biomass cultivated for plant based remediation purposes in metal polluted soils can be thermally treated (combustion, gasification, torrefaction and pyrolysis) and used as potential fuel (biofuel, bioliquids) for obtaining bioenergy. Nanomaterials (NMs) are now well-established in the marketplace worldwide. With their widespread use and application it is of the utmost importance that frameworks are built to ensure the responsible assessment of the hazard and risk they may present and support the development of safe approaches. Furthermore, regulations must implement specific legislative requirements with accompanying guidance and communications to ensure the responsible assessment of nanomaterials before release to market. This ensures safe use for workers, consumers, and the health of the environment as well as the sustainable and responsible application of nanomaterials. For nanomaterial frameworks, standard guidelines and regulatory triggers must be updated in order to account for their differing intrinsic properties compared to their bulk or ionic counterparts. The assessment of environmental and human health hazard can only be conducted when appropriate methodologies have been used to assess toxicity. Considering the current scientific advancements and direction of regulatory frameworks, the use of new in vitro, QSAR and read-across methodologies are important, but the relevance and appropriateness to nanomaterials must be addressed before their use in risk assessments. Further, to assess risk/safety of nanomaterials there needs to be robust tools for the realistic prediction of exposure to humans and in environmental compartments, as well as the appropriate methods for the derivation of derived no effect levels and predicted no effect concentrations, respectively. Currently no well-established exposure models exist for nanomaterials and it is not known if current assessment factors used during risk assessments to derive no effect levels/concentrations are appropriate. There are also knowledge gaps concerning release factors and the most relevant physical-chemical and environmental fate parameters to use for modelling purposes. The ability to suitably parametrize exposure models will allow for the tiered approach to exposure predictions, facilitating realistic exposure and risk assessments as well as the identification of exposure routes and compartments of concern. With comparatively little knowledge of expected release during the manufacture and use of nanomaterials the parameterization and validation of these models presents a great challenge. Against this background, the presentations within this session will focus on activities in relation to risk assessment of NMs at the research-industry-regulation interface concerning: i) Approaches to hazard assessment; ii) Approaches to exposure assessment; iii) Approaches to risk assessment; iv) Assessment of the appropriateness of classic approaches to NMs v) Regulatory risk assessment approaches and frameworks. This session aims to present the latest developments in the regulatory risk assessment of biocides and veterinary medicinal products (VMP) highlighting subjects relevant to both sectors. The topics may cover hazard, exposure and risk assessment, but the session welcomes also presentations related to risk management and regulatory procedures. The experience gained over the last years shows that challenges are often shared across regulatory sectors and the solutions developed may be used across sectors. This session intends to cover both current methods and on-going developments, as well as identifying and advising the scientific community on future needs. For instance, presentations on the regulatory procedure, information requirements and how data is applied in the assessment could provide a background to the current status of the risk assessment. Examples of recent developments may cover updates of environmental exposure assessment tools and development of new exposure scenario documents. Topics related to the future needs could include for instance landscape level assessment and Specific Protection Goals (SPG) in the environmental assessment of VMPs and biocides. New approaches to the regulatory assessment and/or processing such as grouping of substances might bring advances into the current regime which is largely based on a single substance approach. The grouping approach could be an example of a concept that can be applicable to both environmental as well as human health risk assessment. Using the knowledge base across regulations, there is potential to harmonise, facilitate and enhance the regulatory assessment while reducing resources and improving consistency. VMPs and biocides are an example of this. However, the session could be relevant for other substances such as REACH chemicals and pesticides as well since the basic information requirements, risk assessment methodologies and general protection goals have shared similarities under the different regulatory frameworks. In addition, the same chemical substance may be regulated under a number of regulatory frameworks. The perspectives of stakeholders in academia, industry and regulation are sought in order to share developments and to benefit from the technical advances acquired by the different stakeholders. On-going statistics education – the need for accreditation? The effects of oil spills on aquatic and marine environments is a global concern. The damage caused by oil spills to local ecosystems may depend on factors such as the type and volume of the spill, the substances released, the location, the time of year, the organisms affected and other factors. The types of oils drilled, refined and transported vary greatly in their characteristics, making both environmental risk assessments, and selection of oil response strategies highly complex. This session will examine new developments in tracking the fate and transport of chemicals from oil spills, as well as applying new approaches to assessing their biological and ecological effects in ecosystems. Emphasis will be given to new developments in toxicological screening methods, developments in monitoring techniques of chemical constituents and biological systems, and tracking toxic effects at the population and ecosystem level (e.g. adverse outcome pathways). We invite presentations that advance our understanding of the impacts of oil spills on freshwater and marine ecosystems, as well as presentations that discuss mitigation strategies to reduce these impacts.